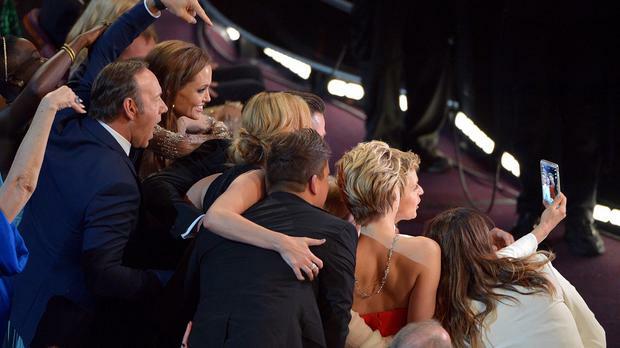 Ellen DeGeneres has brought the selfie to the Academy Awards and broken Twitter records. Oscar host Ellen's photograph during the ceremony - with a line-up of stars including Meryl Streep, Jennifer Lawrence, Kevin Spacey, Angelina Jolie and Brad Pitt - went straight on to Twitter and promptly went viral and by 6am had been retweeted more than two million times. It broke a record set by President Barack Obama with the picture of him hugging First Lady Michelle Obama after his re-election in 2012. Twitter even had to send out an apology because all of the retweeting disrupted the service for more than 20 minutes.